This site is dedicated to preserving some of the history of Rayson-Craft boats and sharing the impact they've had on people over the years. Hopefully it will serve as an online resource to those looking for more information about their boats, how or where to restore and maintain them, and provide a place to promote any Rayson-Craft boats, parts, and memorabilia for sale to keep them in the hands of those who will care for and appreciate them most. This is strictly a "fan" site, it has no official connection with the Rayson-Craft brand. But hopefully some of the people involved with the company will help provide some content and some of the businesses still providing hulls and parts will be involved as well. Please bear with me as this website is a "work in progress!" If you have any Rayson-Craft Boats literature or brochures that you'd like to sell or share through this website, please contact me. Also please create an account and share some pictures of your Rayson-Craft. Growing up my uncle had (and still has to this day) a 1964 "J-hull" Rayson-Craft affectionately called "The Hot Rod Boat" in our family. Living in a different state, I only got a few rides in that boat but it left an impression, the look and sound of coolness on the water. Half the time when we went to visit it was stored for the season in his garage but I always stopped out to take a look and admire it. And it didn't hurt the reputation built up in my mind when my uncle was always happy to tell us how fast the boat would go, especially if he changed props! He always enjoyed telling stories of baiting some younger guy in his bigger boat by pulling along side him and gradually upping the speed, then motoring off long enough to prove the racing heritage of this little boat! Did I mention his is powered by a Tripower 406 Ford? For about 15 years on and off I kept my eye out for a boat like his. Whenever I traveled, I would pick up a Boat Trader or Swap Sheet and scan through it at night. Then as I started working on the computer more and got a little internet savvy I started Google searching "Rayson-Craft for sale". Finally I found a similar hull to my uncle's, and on the east coast to boot! It was in rough shape and not cheap, but it was also only about 1/2 an hour from my family's cottage. I finally made the trip to see it after contemplating the project all winter, and ended up putting a deposit on it. I was thrilled with the prospect of some day having the boat on the water. It was a good start and had the original seats and upholstery to get patterns from and the interior layout was what I wanted. Overall it hadn't been changed too much from it's original setup, it just suffered from some serious lack of attention over the years as many of these old boats do. Well, funny thing was about two weeks later, after returning from a trip and getting caught up on work - out of habit I did the old Google search and what do you know? A boat with the same hull came up for sale in CA that was pretty much turn key! I called just for the heck of it and after a few emails back and forth, some phone calls, and a quick education on uship.com I had another one on the way that would put me in the water late that same season! I bought it based only on pictures, a short youtube video of it idling on the trailer and a few phone conversations with the second owner who knew the boat pretty much since it was new. I lined up a transporter on uship.com and the deal could not have gone smoother,a few small hiccups along the way that were dealt with and the boat arrived just as described to me and in great shape! 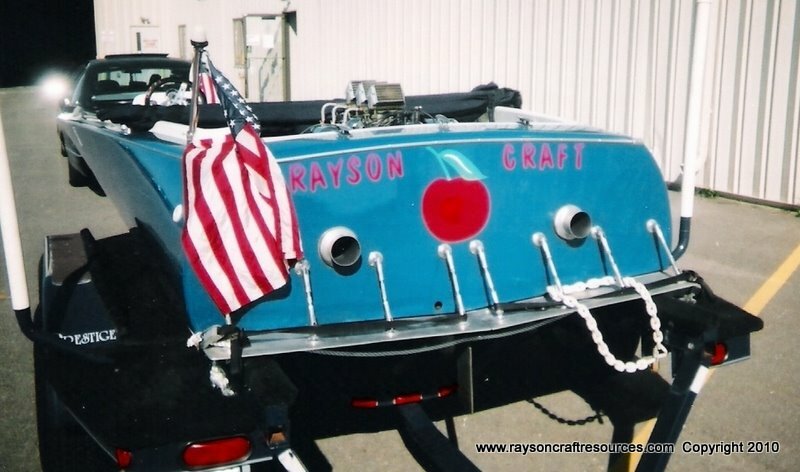 Here's the 1968 Rayson-Craft I found on Craigslist the day it arrived to Western New York from CA, hauled over 2700 miles on it's original trailer - oil bath wheel bearings and all!